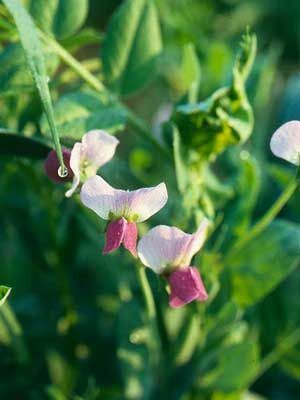 A cool-season annual, winter field peas (Austrian peas), can tolerate heavy frost but are killed by temperatures below -17 to -23C (0 to -10F). When using winter field peas to improve very poor soil, mixing a balanced organic fertiliser into the soil before planting will give better results. Poke holes in prepared seedbed and plant seeds 3 to 5 cm (1 to 2in) deep. Gaps between plants can be filled with an upright grain. Primarily grown to increase soil nitrogen. Highly recommended as a winter green manure to go before sweet corn because of its vigorous nitrogen-fixing activity in early spring. Very low weedy potential compared to other green manures. For maximum nitrogen gain, chop plants down and turn them under as soon as they begin to bloom. You also can pull up the plants and compost them. Allow at least 3 weeks after turning under winter pea residue before direct-seeding vegetables, because the rotting vegetation can cause an increase in damping off of seedlings.